It is one crazy flying machine, looking like something more out of a cartoon than something that can actually fly. Part of its strange, bulbous shape comes from its roots as a Me 321 military glider, an aircraft that was key to Hitler’s plan to invade England. From this genesis came the largest land based operational transport of World War II: the Messerschmitt 323 Giant. The problem was straight forward: How could the Nazis be able to airlift heavy equipment and vehicles across the English Channel as part of an initial invasion of England? The answer came from a demand sent down from Luftwaffe High Command in October of 1940 to Junkers and Messerschmitt. They had to submit proposals for a large heavy transport glider, and they only had 14 days to do it. This “super-glider” had to be able to carry either a 88mm gun and its half-track surrogate or a Panzer IV tank. Initially, Junkers blended wing-body-like Ju322 was chosen, but because Junkers elected to use a high-grade lumber in its design, it was reasoned that it would be very hard to produce in large numbers and quickly. Additionally, the lack of a fuselage made the aircraft somewhat unstable during the type’s only test flight, and the reality of a deep redesign was more than commanders wanted wait through. With the Ju322’s failure, the Luftwaffe went back to Messerschmitt for a usable design. After bounding around between hybrid’s of existing projects, the Me321 was proposed and eventually accepted into service, although this was after Operation Sea Lion, the invasion of England, was cancelled. Instead the Me321 was used fairly extensively on the Eastern Front in the bloody fight against Communist Russia. After being successfully used in Russia, and after receiving good reports from pilots who flew Me321s in the field, the decision was made to produce a powered variant for heavy point to point transport duties. Design began in earnest by early Spring of 1941. The Me323 “Giant” would feature four French Gnome et Rhone GR14N radial engines capable of a maximum output of 1,164 horsepower each. The idea was that the Me323 didn’t have to get anywhere that fast and using French engines would not put any extra stress on Germany’s struggling wartime industrial production. After tests with four engines, a remodeled fuselage and a highly strengthened wing, it was clear that the Me323 was not going to be able to carry much without getting assistance from a powerful tow aircraft, a formation of three Bf110 heavy fighters, which was seen as very dangerous, or by attaching rocket assisted takeoff units to the outboard sections of the wings. Even with five engines there would not be enough power to have the aircraft takeoff by itself with a large load. As such, the Me323V2 was built with six engines. This gave the “Giant” a truly intimidating appearance and would allow the aircraft to takeoff, cruise and land without assistance while carry a full load. This configuration was later known as the Me323D. The final production configuration of the Me323 had a high wing made of wood and fabric that was braced near the center of the wing and fuselage. The fuselage was built out of a tubular metal skeleton with wooden cross-beams and fabric covering. The cockpit sat high atop the aircraft’s bulbous nose, which was a clam-shell door design, allowing it to open wide for outsized cargo to be loaded and unloaded. The cargo hold was cavernous for the time, measuring 36 feet long, 10 feet wide and 11 feet high, which is very roughly the size of a first generation C-130’s cargo hold. All said, the Me323 could carry a wide variety of items. For example, it could haul a pair of four ton trucks or 52 drums of fuel or 130 fully outfitted combat troops. Just because it could lift a lot didn’t mean it could do so quickly. The Giant’s maximum speed was a paltry 135mph at sea level, and that figure got only worse as it climbed. This was helped somewhat by replacing wooden propellers on early models with metal variable pitch propellers on later ones. A crew of five was used on most missions, which included two pilots, two engineers and a radioman. During flights through areas that were of high risk, the radioman and the engineers could man three of the aircraft’s five MG 131 machine guns, although dedicated gunners were often carried for these higher-risk missions, allowing the crew to concentrate on flying and navigating, while still employing all five guns against Allied fighters. The Giant’s five .51 inch machine guns were located on the aircraft’s upper wings and in the nose and tail. The metrics related to the Me323 are telling for its time. It had a wingspan of 181 feet, a length of 92 and a half feet, a max takeoff weight of 95,000 pounds, a ceiling of 13,000 feet, and a range of about 675 miles. It was a big, inefficient beast, but it wasn’t very complex and it was sturdy enough for operating out of austere locations while also making as small of a dent in Germany’s over-stressed aeronautics industry. The timing of the Me323’s introduction into service was good for the Nazis, as shipping into Northern Africa was under incredible pressure by Allied forces. As such, a massive airlift was organized to provide Rommel’s Afrika Korps with the constant stream of supplies needed for the doomed Tunisian Campaign. During its constant Mediterranean crossings, the Me323s were like sitting ducks. They were just about the easiest thing to spot in the air, they could not maneuver, they had pretty light armament and were cruising at what is a modern jet airliner’s stall speed. As such, they got pummeled by Allied fighter patrols, but because they were so big and basic, many kept flying riddled with holes and pieces of their wings and fuselage missing. On the 22nd of April, 1943, 27 Giants were crossing the Sicilian Straits with Bf109 escorts when they were pounced on by Allied Spitfires and P-40 Warhaws. All but six of the Me323s were lost. Since the formation of Me323 were carrying fuel and oil, many of those that went down did so in huge fireballs. It was a horrific day for the Giant force to say the least. The 22nd of April “turkey shoot” was an extreme case, but the fact that losses were heavy among Me323 was not necessarily due to the aircraft itself, but more so due to the scenarios they were thrust into. Any heavy transport would have been vulnerable to similar attacks, and if those transports were more complex, they may not have fared as well as the wood, metal and fabric Me323s. To their credit, the Giants were hard enough to kill that special training literature was given to allied pilots, showing the vulnerable areas of the Me323 including its fuel tanks. This was so pilots would know where to shoot in order to not waste their ammunition just punching holes in the aircraft’s wood and fabric hide. The simplicity of its design, and the fact that they were being shot down regularly by Allied fighters sometimes in spectacular fashion due to their combustible cargo, resulted in the aircraft acquiring less than loving nicknames given by German soldiers. “Elephant Bomber” and “Adhesive Tape Bomber” were common terms used when referring to the Me323 in the field. In the end, about 213 Giants were built, with many slightly different variations mixed in that total. Two exotic outgrowths of the type are worth mentioning, the first being the Me323Z “Zwilling.” This monster consisted of two Me323 fuselages that worked as booms, connecting a single wing and tail section. It was equipped with no less than nine BMW engines. A single massive prototype was built, with the aircraft breaking up during its initial test flight. The breakup was the result of a strafing run by allied fighters that occurred just hours before its first flight. Repairs were made, but the structural damage was more invasive than what engineers through at the time. Before the aircraft broke up, it had dropped a 35,000 pound bomb that was being tested by Nazi scientists. The aircraft would have been the delivery system for this massive weapon, along with being an ultra long-range bomber and missile carrier if it had entered production. The other unique Me323 was the the “E-2” model, dubbed “Rhino.” The idea was fairly simple, turn a Me323 into a giant flying gunship that could protect other standard Me323s from marauding fighters. The Rhino had armor plating added to critical areas, a solid nose that sprouted a 20mm cannon, and about a dozen extra guns scattered all around the aircraft. 21 crew were carried to operate all the armament. Two of the gunships were built and tested. The conclusion was that fighters were much better escorts than an up-armored and up-gunned Me323. As such the project was cancelled. Although it was extremely unglamorous, severely ugly and technologically simple, the Me323s served an indispensable role for the Nazis during World War II, and their crews had to be some of the bravest around. The Me323 also saw limited service on the Eastern Front, but their contribution was nowhere as large as the air bridge they provided the Nazis in Northern Africa. 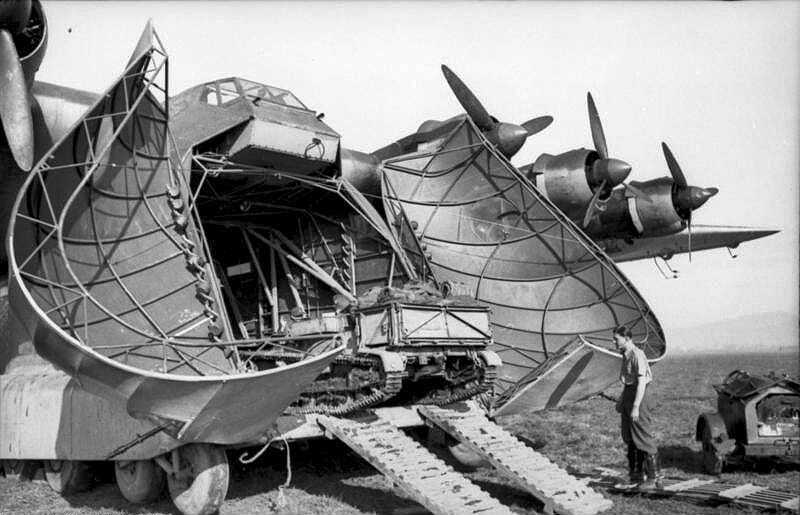 By the summer of 1944, no Giants were left in flyable condition, a testament to just how much punishment they suffered during their brief yet violent time in service.